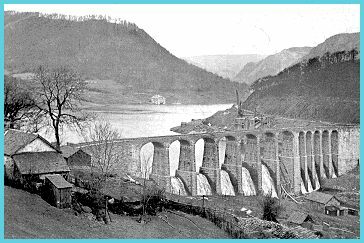 The famous English poet Shelley was very fond of the Elan Valley, and in 1811 he stayed for a short time in two country houses in the area. The two houses were Cwm Elan near the River Elan and Nantgwyllt, close by the River Claerwen just before it joined the Elan. This photograph shows Cwm Elan house, with the River Elan in the front of the picture. The house had belonged to Shelley's uncle. The mansion was in a very beautiful spot, with woodlands and hills behind the house and lawns sloping down to the river at the front. In the picture below you can see Cwm Elan in the middle of the picture, and the almost complete Garreg-ddu dam in the foreground. The water was then very close to the house, which was knocked down before the reservoir was finally filled.